Using cultural information and stories for comprehensible input. How do I type in French on my U.S. Keyboard? 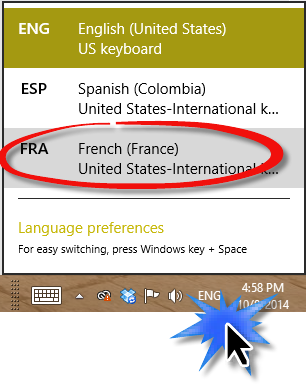 Quick steps to install French as a language and set up the keyboard so that you can type with your United States, QWERTY, keyboard. French people living and working in the U.S. Choose the language you want from the task bar at the bottom right. Now you can type accents everywhere. At first, you may want to refer to this guide, but eventually, it will become second nature.